I am a humanist. I am a feminist. I am an environmentalist. I am a libertarian. I am a pacifist. I believe in democracy. I am an agnostic. Traditional Jewish prayer is not any of these “ists” or “ics”; it reflects the worldview of the rabbis 1500 years ago, who may have been quite sagacious but did not share many of my values. The minor and major edits, deletions, and additions to which liberal Jews of this day and age have treated their prayers have inserted some of these sentiments, but for the most part the macro structure of prayers has been preserved, making it difficult for people to engage with the prayer in a straightforward way. The composers of liberal prayer books understand this, and thus we find the phenomenon of alternative or additional English readings and/or very creative translations that bear little relationship to the original prayer. There is another way forward, though. We can compose new prayers and poetry in the original Hebrew that reflect our values and revitalize our canon. This is the way I chose. This Kabbalat Shabbat service is the first in a series of humanist prayer books for specific occasions. It is not meant to offer a comprehensive substitute to traditional prayer; rather, it is meant as a supplement and catalyst. If some of these poems strike a chord, great! If none of the poems speaks to you, I still hope and pray that upon reading them you become mobilized to compose prayers that are as meaningful to you as these are to me. 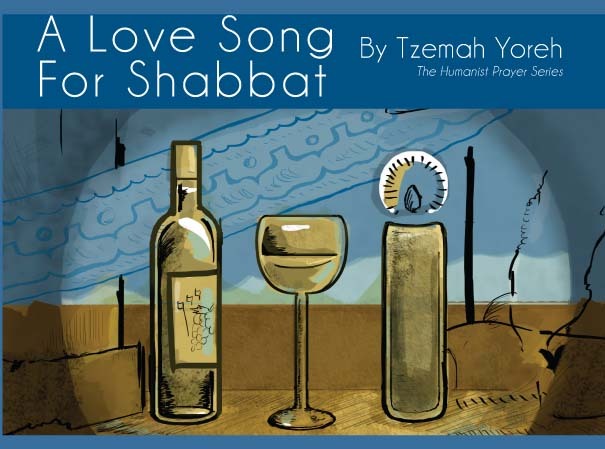 “A Love Song for Shabbat, a Humanist supplement to the Kabbalat Shabbat Siddur by Dr. Tzemaḥ Yoreh” is shared by Tzemaḥ Yoreh with a Creative Commons Attribution-ShareAlike 4.0 International copyleft license. Please reciprocate for any adaptation or redistribution of this work by (1) properly attributing the work to Tzemaḥ Yoreh, (2) clearly indicating the date you accessed the resource and whether any changes have been made (and if so, please be in touch with us and leave a comment below so that we might note your adaptation or improvement), (3) providing a link back to this source, and (4) specifying the Creative Commons Attribution-ShareAlike (CC BY-SA) 4.0 International copyleft license under which this work was shared.